Today I launched Evernote on a secondary Mac, and while it was updating and migrating notes to the new version, I created my document temporarily in TextEdit. It's a simple list with two columns, separated by tabs, and I was able to create it effortlessly. Then, after Evernote was finished updating, I copied the text from TextEdit and pasted it into Evernote. And anarchy ensued. :-/ And yes, both apps were using the same font: Helvetica Regular, size 13. But...anarchy! So, I began positioning my cursor in front of the 2nd-column lines and hitting Tab to correct the discrepancies. But that doesn't work either -- because in Evernote, tabs are not really tabs. It's difficult to describe Evernote's implementation of tabs: Sometimes, tab aligns the cursor with previous columns, but often it does not. So, the user is then forced to experiment with various combinations of tab, plus-or-minus a few spaces, in an attempt to get items to sorta line up. I say "sorta," because it's often simply impossible in Evernote to get tabbed columns to align perfectly at all. Why, after all these years, hasn't this been addressed? It's been nearly two years since I started this thread. Yet, not one change to tabs—a fundamental feature. The Evernote team doesn't care about user requests nor does it care about fixing long-standing bugs. But remember: They're raising prices! Even so, Evernote just inserts 5 spaces in the current font, so there are no actual tabstops. But yes, you can make things line up with them. As noted any number of times in the forums, Evernote does not support tab characters in note content. Best guess is that that's because tabs are just whitespace with no intrinsic meaning in HTML, which underlies the Evernote format. In HTML, tabs are not tabs either, not in the same way as they are in a text editor. 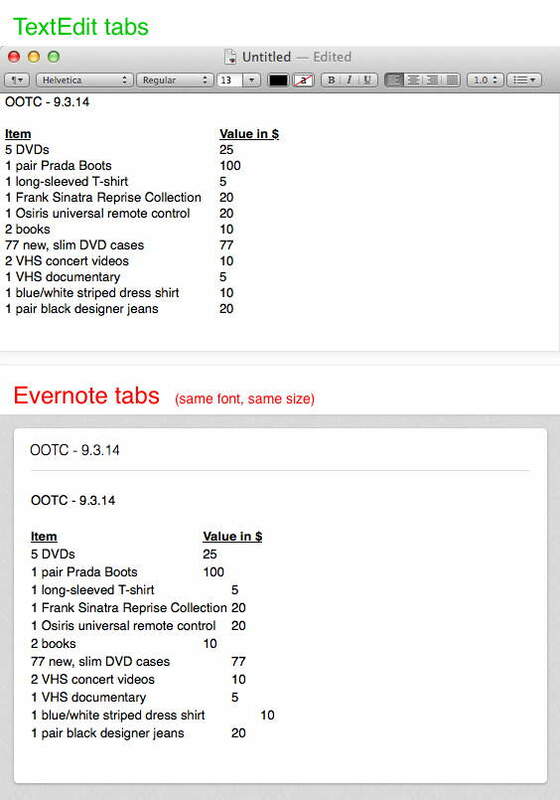 If you want things to line up in Evernote, you use indent/outdent, lists (bulleted or numbered), or tables. I'm not able to find it at the moment, but I'm pretty sure I saw something on the forum in the last couple days stating that the Table function on the Mac client had vastly improved in the latest Beta version. I *could* be wrong so please don't quote me on that, but it might be worth investigating. Yeah. Just got back to evernote as trying it as alternative to Apple Notes. Got all excited of how nice it was again, and then, as I write notes, hit tab, hit it once too many, hit backspace and NO, I have to press backspace multiple times to get back roughly where it was. As keeping notes go, I indent a lot. And I expect it to work from keyboard, prefferably with tab and back-space. I'm not going to change my writing flow to suit the program, rather go to google docs or some other alternative. I can't see how the user benefits from the program behaving like it does. As I have history with it, I'm going to look at shortcuts and see if I can map sensible indenting to the tab-button, but this is really streching it. Dear developers, this is a deal-breaker for me. I assume that I'm not within your intended target audiences. Shame, as I've liked evernote throughout the years. I'm a pro user, just reiterating this as a need. I was about to take notes on a project and decided to use Google Docs instead. Why? Tabs work correctly there. Any update around this ? Feature we need asap. Please support tabs and tab stops properly. It's preposterous to pretend that spaces serve the same purpose, and equally absurd to suggest tables as the alternative. The whole point of taking notes is to have it be very easy to create content--and counting spaces to align text with at best half-character accuracy is antediluvian. I am hard-pressed to find ANY modern word processor without this feature. Please support tabs and tab stops properly. +1. Makes me want to switch to OneNote. I really, really, really, don't want to switch. +1 Agree... this is so disappointing to not have such a simple and widely available feature in any text processor. Also expecting this to be done from a premium user. or at least a workaround should be provided. Im also using onenote as well the editing is sorry to say better there. The tab is one feature that I miss. Unfortunately, I ended up on this thread, because I wanted to be able to align text within a table cell, so I wanted to press <Ctrl><Tab> as I'm used to doing in other apps when in a table, but unfortunately, nothing. I even tried adding another column to the table to use for the content I wanted lined up at a tab, but learned that we can't change the color of individual borders within the table—it is the entire table borders or none. The content wasn't going to look right with a vertical line between the text to the left and the text to the right. So seems that we still have very limited options for lining up text. Indents only work if what you want to line up is at the beginning of the line. You can't type a few words and then indent, as it will indent at the beginning of the line, not where your cursor is. I am a paying customer of Evernote and I cannot understand how such a basic text formatting feature as tab stops is not supported. The funny thing though is that they actually are. If I copy a tab character from Mac OS textedit and paste it into Evernote for Mac, it words just like it should be but for some reason pressing the tab key inserts four spaces instead. WHY??? Upvoted. Defintely a must to organize my notes better! Upvoted. Please please please implement this. It's very frustrating not to be able to do such a simple thing. Bullet lists are not at all like tabs. It isn't just for long documents. Even simple, short notes like the one OP posted benefit from the use of tabs.